Mouth tumors can cause obstructions that make it difficult for pets to chew and swallow. Surgical reduction of growths is often necessary for a pet's survival, but it isn't always possible depending on the tumor's type and location. Learn more about these tumors and how they're treated. The good news is that every tumor doesn't automatically blossom into full-blown mouth cancer. According to the Pet Cancer Center, tumors can be divided into two main categories. Benign tumors are noncancerous growths that, in general, are easily removed by surgical means. These growths are usually well defined at the edges without the type of invasive growth into bones and other tissues that are typically seen with malignant tumors. Benign tumors also don't spread to other parts of the body. The most common type of benign tumor found in dogs is an epulis. These tumors can be found growing on the periodontal ligament. 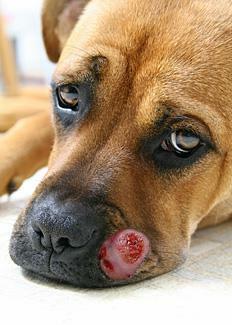 Malignant melanomas: This type of tumor is the most common mouth cancer in dogs. It is very invasive, and this makes surgical removal quite challenging. It also tends to spread rapidly so by the time an owner may notice something wrong with her pet, the cancer has probably already spread to other parts of the body. Even if the melanoma is only confined to the mouth area, the tumors can be quite painful for a dog and restrict his or her ability to eat. Squamous cell carcinomas: These tumors can grow quite aggressively but tend to remain in one localized area without metastasizing. Fibrosarcomas: These tumors are very similar to squamous cell carcinomas in that they tend to resemble a bit of red cauliflower and generally don't metastasize until late in their development. Acanthomatous ameloblastomas: These tumors can be extremely aggressive and cause a lot of destruction in surrounding mouth tissues, but luckily they don't tend to spread. 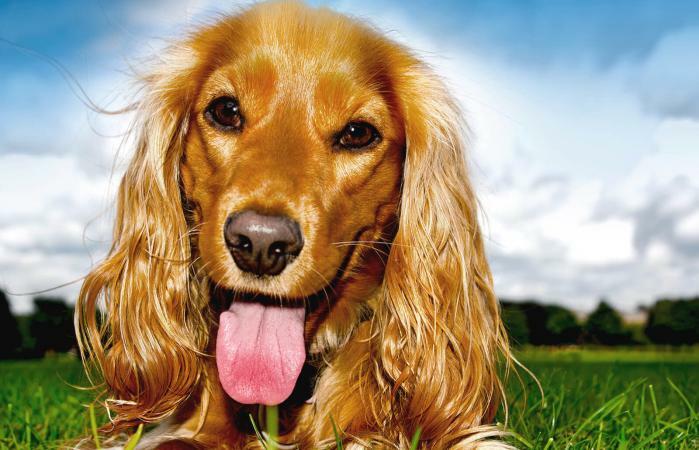 What Causes Canine Mouth Cancer? Although it isn't yet possible to determine exactly what spurs the growth of cancerous cells or tumors in a dog's mouth, there are a few theories. Carcinogens may actually be inhaled by dogs as they sniff the ground and, generally, everything else around them. Cancer-causing agents then have the opportunity to take hold and affect surrounding cells, causing the abnormal cell growth that results in cancer. Dogs may actually consume carcinogens. A research study found a possible link between some commercial dog foods and canine mouth cancer. Some brands actually include chemical preservatives and pesticides in their formulas that may also be carcinogenic, but further study will be required to confirm these early results. Early detection is the key to increasing the success rate in the treatment of all mouth cancer in dogs. Sometimes it is already too late to help a pet who is only just beginning to show symptoms of being sick, so it pays to be diligent. There are four stages of oral cancer that is based on guidelines from the World Health Organization. Stage I has tumors that are two centimeters or less in diameter. Stage II has tumors are between two and four centimeters. Stage IV is the point where the tumors spread into other unrelated areas of the body (metastasis). More aggressive treatments may be supported by holistic therapies including giving herbal, mineral and vitamin supplements. Treatment can be expensive with the cost of removing one tumor running from $1,000 to $2,000, plus additional care costs including blood tests, x-rays, medications, and more. ONCEPT® Melanoma is a vaccine developed by Merial to help increase the life expectancy of dogs during stage II or stage III oral cancer. Unlike a vaccine given to prevent a disease from occurring, ONCEPT is given to dogs diagnosed with oral cancer in order to bolster their body's immunity to cancer cells. Merial's research has found that the vaccine can extend a dog's life up to one to two years if the dog receives either surgery or radiation treatment as well. ONCEPT can only be obtained from a veterinary oncologist, and the cost will vary based on your veterinarian's schedule of fees although you can expect the cost to be in the range of $2,800. The life expectancy of a dog with oral malignant melanoma largely depends on when it is discovered and treated. If a dog has no medical care, their life expectancy will be approximately two months. If the dog has surgical treatment, the average life expectancy is anywhere from five to 17 months. Dogs given radiation therapy tend to live seven to 12 months. The Merial melanoma vaccine has been found to give dogs a life expectancy of about seven to 13 months. Dogs that have the vaccine, as well as surgery or radiation, have been found to live up to two-and-a-half years after diagnosis. Dogs with oral squamous cell carcinoma have a very short life expectancy if the tumors are located in the tonsils. Surgery on the tumors on the lower jaw (mandibulectomy) gives an average survival time of 19 to 26 months. Dogs with surgery on the upper jaw (maxillectomy) have an average survival time of 10 to 19 months. Dogs that receive radiation therapy have a survival time of 15 to 16 months although with surgery this can go up to 34 months. Are Other Pets at Risk? If you have other pets in the home, there is no need to worry about the risk of contagion. Cancerous tumors are not infectious and cannot be passed from one to pet to another, or to any humans in the household. It can be devastating for an owner to learn that her pet has cancer, but routine checks of your dog's mouth will help you find any abnormalities as soon as is humanly possible. This just might increase your pet's chances for survival.